Our Botanical Art Class is run by Award Winning local Artist Julia Trickey. You will explore seasonal flowers in pencil, pen and watercolour. Take time out to get absorbed in depicting the beauty and detail of spring subjects, such as primroses, tulips and other bulbs. On this workshop you will look at how to capture the character of our chosen subjects in line, tone, pen and watercolour washes. The session will be delivered through group presentation and discussion, tutor demonstration and individual one-to-one help. Suitable for all levels. Plant subjects will be provided, and an equipment list sent to you before the session. (The tutor will have a limited stock of equipment for use during the day). This class will run from 10:30am to 3:30pm at our Lacock Garden Centre. 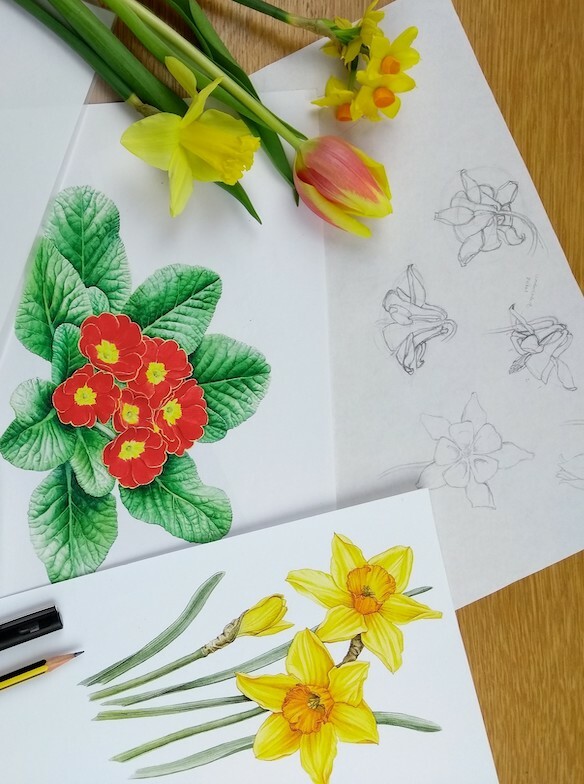 Julia is an experienced tutor who has been painting botanical watercolours since walking into an adult education course some twenty years ago. She is a member of botanical art groups from local to international level and has work in collections worldwide. Her paintings have earnt her 4 RHS gold medals amongst many other awards.